Disciples of Christ (DoC) and many other denominations schedule the observance of the Transfiguration on the Sunday before Ash Wednesday, the beginning of Lent. The transfiguration of Jesus is an event reported in the New Testament when Jesus is transfigured and becomes radiant in glory upon a mountain (see Matthew 17:1–8, Mark 9:2–8, Luke 9:28–36, and 2 Peter 1:16–18). Jesus and three of his apostles, Peter, James, John, go to a mountain (the Mount of Transfiguration) to pray. On the mountain, Jesus begins to shine with bright rays of light. Then the prophets Moses and Elijah appear next to him and he speaks with them. Jesus is then called “Son” by a voice in the sky, assumed to be God the Father, as in the Baptism of Jesus. 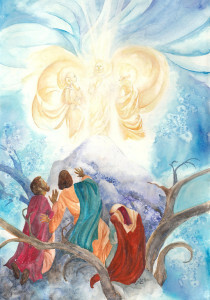 The Transfiguration is one of the miracles of Jesus in the Gospels and the setting on the mountain is presented as the point where human nature meets God: the meeting place of the temporal and the eternal, with Jesus himself as the connecting point, acting as the bridge between heaven and earth. From the time of the Transfiguration, Jesus sets his face to go to Jerusalem and the cross. Moreover, Christians consider the Transfiguration to fulfill an Old Testament messianic prophecy that Elijah would return again after his ascension (Malachi 4:5–6).